If you're anything like me, you might not have found everything you were looking for during all of the Black Friday craziness. Luckily, there's still Cyber Monday! Originally, I wasn't planning on any Cyber Monday shopping, but since my Black Friday was somewhat disappointing, I've been scouring the web to find the best deals on budget beauty brands. Check out this list that I've compiled for you guys to help us all save some cash! I'd love to hear about any cool purchases you make. Also feel free to let me know if I'm missing something on this list that you feel is important! 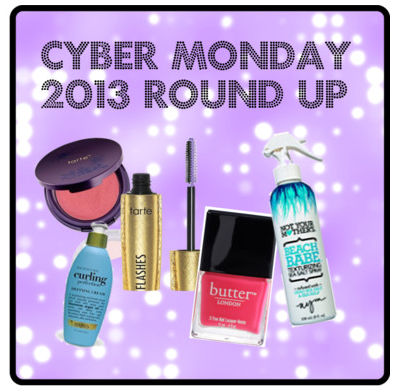 ButterLondon: 12/2 Get 20% off regular priced items sitewide and 50% off items marked "Last Orders" using the code CYBER13. Clinique: On 12/2 Get 3 FREE moisture minis with any purchase. Use the code DRY or OILY depending on your skin type. e.l.f Cosmetics: Today 11/30 enjoy BOGO 50% off sitewide and a FREE $10 Gift Card with your order until midnight. Use the code BLKFRI at checkout on orders of $30 or more. On 12/2 Score a 50% discount on all orders of $30 and up on Eyes Lips Face's website. Stila Cosmetics: From 12/2-12/9 save up 80% on select Stila products during their annual warehouse sale. tarte Cosmetics: 11/30-12/1 Get 25% off your order and free shipping on orders of $40 or more using the code TURKEY at checkout. 12/2 all mascaras $10, blushes $20 and maracuja oil $30 and lash enhancer $40. Ulta: For the hair lovers on 11/30 Ulta is offering B2GO (Buy two get one) FREE on with the purchase any Organix product and on 12/2 BOGO FREE on Not Your Mother's hair products. Use the code JINGLE13 to get free shipping on any order $25 and over. Urban Decay: On 12/2 Get your hands on the 2011 Book of Shadows Vol. IV and a sample of Revolution Lipstick for only $25. Yes To: On 12/2 Yes To is offering a $2 discount on single item products site wide from 12pm to 2pm. Disclosure: The photos featured in the collage in this post were not taken by me and are credited to the manufacturer's website. The collage was created using Polyvore. Yay, so happy it helped you, Greta! Greta post! I love Stilla products and I have been wanting to try Butter polish!